Chen, a researcher at Arizona State University's Biodesign Institute and professor in the PolyTechnic Campus' College of Technology and Innovation, is the first to demonstrate a plant-derived treatment to successfully combat West Nile virus after exposure and infection. The research appears in this week's issue of the Proceedings of the National Academy of Sciences (advanced online edition). There are currently no available vaccines against West Nile, nor effective therapeutics for human use, so the current findings are a considerable advancement and may offer the best hope thus far that the West Nile virus infection can be stopped, even several days after viral infection. West Nile virus has made alarming inroads in North America, causing disease outbreaks throughout the U.S., as well as in areas of Canada, Mexico, the Caribbean and South America. Elderly individuals and those with depressed immunity are particularly vulnerable to West Nile, a mosquito-borne illness which can cause a potentially lethal inflammation of the brain. 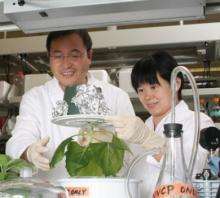 Chen's group demonstrated the versatility of plant-based biotechnology. "The goal of this research was twofold," said Chen. "First, we wanted to show proof-of- concept, demonstrating that plant-made antibodies can work as effective post-exposure therapeutics. Secondly, we've sought to develop a therapeutic which can be made inexpensively so that the health care systems in developing countries can afford it." Issues of affordability for such antibody-based treatments are central to the challenge, Chen stresses, with the costs for development of a traditional pharmaceutical mammalian cell line production facility often running into the tens of millions of dollars. Besides being inexpensive, plants offer other advantages. Mammalian cell lines may run the risk of harboring animal pathogens such as viruses or infectious protein agents known as prions, not found in plants. Plants also allow production of pharmaceutical products to be easily scaled up to whatever quantities are required. "With mammalian cells systems, the physical size of the bioreactor is limiting," said Chen, "whereas with plants, we can just plant another acre." The study examined antibodies against West Nile virus derived from mammalian cell lines and compared their effectiveness with those extracted from plants. The plants used to produce the antibodies are a relative of common tobacco, a member of the Solanceae family of plants, which produce abundant leaves for harvesting material and are also prolific seed producers. Seven days after the introduction of antibody genes into plants, the leaves are harvested, homogenized and purified to remove extraneous material. The strategy for gene insertion is to use the specific machinery of the tobacco mosaic virus and potato virus X (PVX) to carry the genes of interest into the plants, where they can be expressed, yielding a human monoclonal antibody known as hu-E16. The gene expression occurs in just a week's time, making the production process highly efficient. The monoclonal antibody, once injected into the recipient, binds to a particular surface protein of the virus. That binding site is also the one used by the virus to attach itself to mammalian host cells, and once it is occupied, the virus' cell-binding (and infectious) capacity is neutralized. Cell-derived versions of this antibody have already demonstrated impressive effectiveness, protecting mice from WNV-induced mortality even several days after infection. Chen's research shows comparable effectiveness using tobacco-plant derived monoclonal antibodies. Indeed, the results in the groups of mice tested, were essentially indistinguishable. The therapeutic, Chen emphasizes, is effective in very small dosages, (50-200 micrograms), and only one dose is required to clear the virus from an infected individual's system. The effectiveness of the plant expression system is dependent in part on the optimization of the antibody DNA sequence, which helps to ensure a high level of expression in the plants. "The goal is to make more of the protein and for it to persist longer before it is degraded, " said Chen. "Optimization helps." The strategy permitted the group to set a record for the antibody yield produced by the transgenic tobacco plants—an increase from 500 micrograms of antibody per gram of leaf tissue to 800 micrograms per leaf. Because the monoclonal antibody therapeutic binds to a conserved region of the viral surface, it can be effective against a variety of West Nile virus stains and potentially against other flaviviral strains. Here, another advantage of plant-derived as opposed to animal-derived antibodies becomes important. If an individual is exposed to a variant strain of virus differing in some particulars from the antibody used to treat it, there is a chance in the case of the mammalian cell-derived therapy to actually worsen the condition, through an effect known as antibody dependent enhancement. The process has been studied in some detail in dengue fever, a related flavivirus. Chen emphasizes that plant-based antibodies lack the capacity to bind with a critical receptor implicated in the antibody dependent enhancement effect, making them potentially safer for use. The completion of this research relied on the efforts of a large, interdisciplinary team, including lead author Huafang "Lily" Lai. Michael Diamond of Washington University collaborated in studies with the mouse model. In addition to Chen's ASU scientist colleagues, Thomas Keller, an undergraduate in ASU's School of Life Sciences Undergraduate Research program appears as a co-author of the PNAS paper, having carried out much of the critical protein expression and characterization work. "This was a very remarkable achievement for an undergraduate student," Chen points out. The research was supported by grants from the National Institute of Allergy and Infectious Diseases, and Keller's work was supported in part through the Howard Hughes Fellowship for Undergraduate Research. While the group's focus has been on West Nile Virus, Chen believes the plant-based antibody approach could provide highly effective, cost efficient therapeutics for other diseases, including related flavivirus infections such as dengue fever and Japanese encephalitis, if the successes in mice can be replicated in humans. One challenge in treating a virus like West Nile, which targets the central nervous system, is that current antibody therapeutics are unable to pursue the virus into its sanctuaries in the human brain, due to the existence of the blood brain barrier. If this obstacle can be overcome, it may be possible to produce therapeutics capable of eradicating the infection even after 6 or 7 days, when a significant amount of virus has colonized brain tissue. Toward this end, Chen is now working on bifunctional antibodies, capable of binding with virus particles as well as attaching to receptors in the brain, allowing the antibody to migrate past the blood brain threshold. If successful, the technique may allow treatment of other, currently intractable infectious and neurological diseases. "If we can find a way to deliver therapeutics of this sort into the brain it will be really significant," said Chen.